It’s been…oh…I dunno…let’s call it “a little while” since I last updated things here at Fruit Maven. Since we last spoke, I’ve traveled to 4 states, 6 countries, eaten fruit on 3 different continents, and generally enjoyed my juicy self. But, I’ve been remiss in telling you about it. You should be mad to be honest, really mad. I mean…one time I even realized I was literally crying at the vast number of new apples I’d stumbled upon in London’s Borough Market. Maybe I’ve gone soft in my old age. Maybe it’s good that I’m writing less and enjoying more. I don’t know. Now that I have more connections in life, more people send me things to try. Generally I do not bother you with these things. Not because I’m enjoying myself as stated above, but because they are crap. Seriously. Not good. You’re welcome. This one’s different. 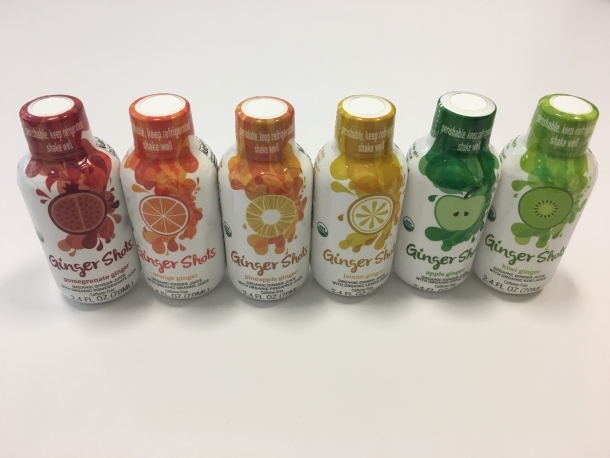 I really liked it and I happen to really like ginger and believe in its health benefits and I happen to be on/off in to juicing for the last few years – a love of fruit will do that. So I recommend this one! They are tiny little puckery organic ginger shots. No work required (my favorite). I don’t get anything for writing this, so don’t worry about that. You can check out the company info at gingershots.com. But if you are looking for a healthy, mini little pick-me-up, check them out. They come in various flavors, which for the most part taste unequivocally like GINGER. I thought the kiwi, apple, pomegranate and orange all nicely rounded out the ginger flavor. Apple and orange were probably my favorite. The pineapple wasn’t particularly noticeable and the lemon was essentially unbearable. I couldn’t eat that one. WAY too sour. That being said, a friend of mine only orders the lemon one, so…to each his own I guess. Check ’em out and let me know what you think.